This is another toddler quilt for the Bay Area Crisis Nursery. It was sometime in 2006 that I bought Judy Sisneros' book, "9-Patch Pizzazz" . 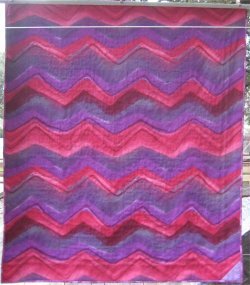 I just loved the graphic nature of the designs and how you could use a great focus fabric and companions to create the quilts. The full title of the book is "9 Patch Patch Pizzazz..... Fast, Fun & Finished in a Day" and it's no lie! Because the quilts are small in size and the blocks are relatively large, it goes together *FAST*. The purple is *so* weird that I figured I was never, ever, ever going to find a compatible companion for the 9-patch pizzazz ... but to my everlasting shock, I had several selections in my stash. How the heck did those get in there??? After all, it was just *weird*; why would I have those sorts of colors? This is definitely NOT my usual color selection! I had a green linen-type fabric that EXACTLY matched the weird-o green background. I remember using the main part of this linen-type as pants for my oldest daughter when she was a squirt. I saved the remnant all these years (like about 20!) because the piece was big enough to use "someplace". 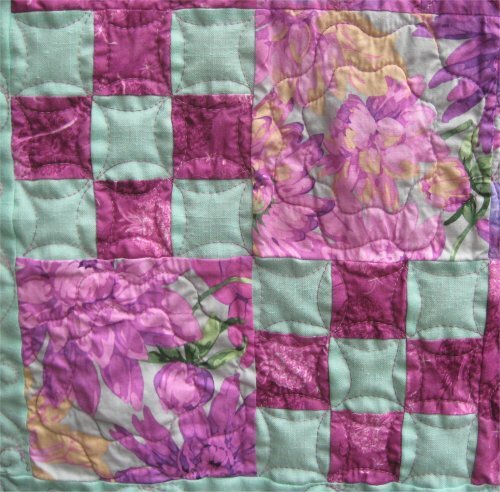 The quilting for Lily Pond was fun. 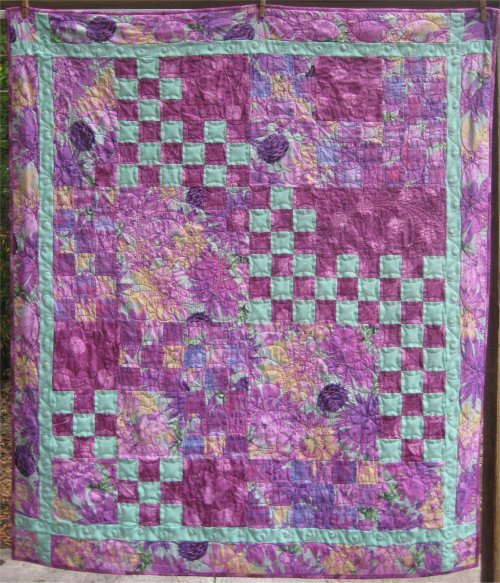 The big focus fabric blocks were quilted with Sally Terry's "Hooked on Feathers". I am continually amazed at how EASY that technique is for doing feathers. 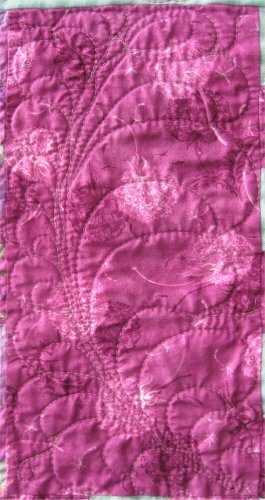 I did a curved feather on the solid fabric. I did curved feathers on the print fabric. I even did a feathered wreath! woo hoo! 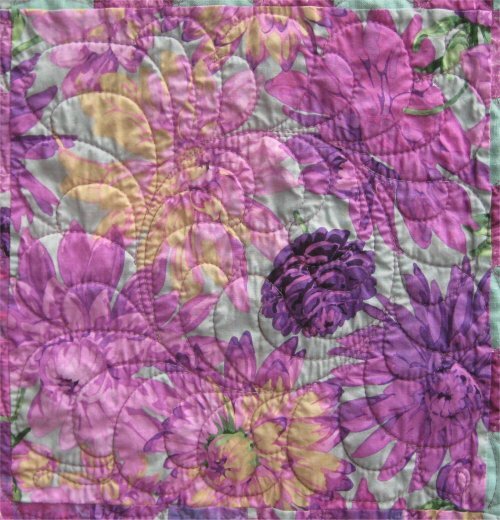 For other focus fabric blocks, I used a new specialty flower template I had recently purchased from The Quilters Rule. 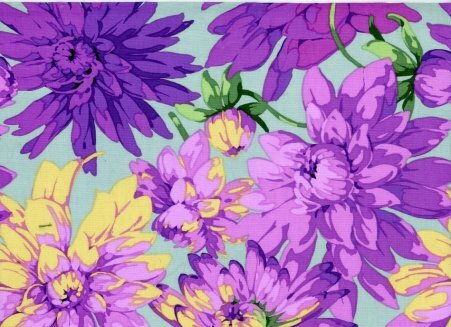 This daisy template is one of those nifty nested ones that allow you to stitch the shape INSIDE the template ... if the shape is circular, as this daisy is, your arm doesn't get in the way! Additionally, you can use both the inside and outside of each nested template to stitch the size shape you need. 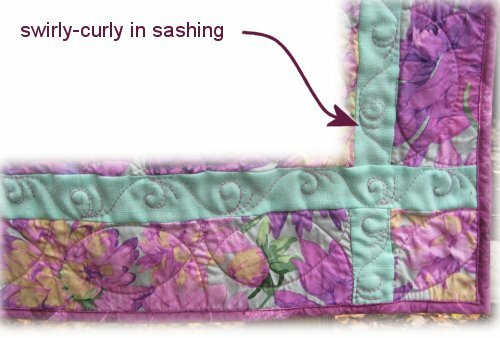 The sashing was done with another of Carla's tutorials ... her Swirly Design for sashing. One of these days, I'm going to need to venture from just the basic swirl! Honestly, though, this is the all-time BEST design for narrow strips. I just love it. The final, outer border was done in a design that has several names ...Slim Darts, Simple Welsh Trail, Curve and Point, Diamond Cable and Eggs & Darts (the traditional name). 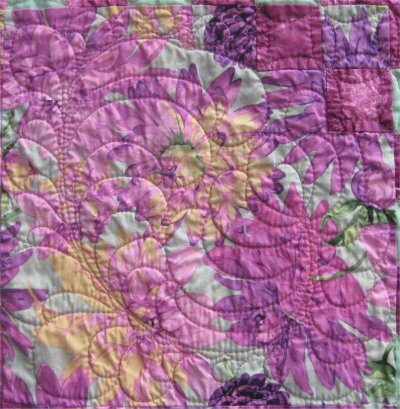 My thanks to my quilting buddies, Ompuff, Kelly Misty, Anita Grossman Solomon and Colene, on About.com's Quilting forum for their research efforts! 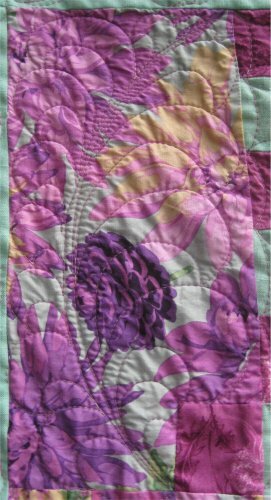 I'm pleased with the pattern and the quilting I did. It was an excellent vehicle to practice all the feathers ... it'll go to the local charity that I support by giving quilts, the Bay Area Crisis Nursery.